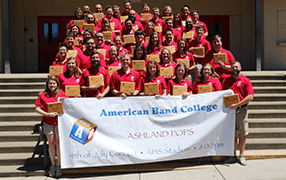 American Band College of Central Washington University is the largest master's degree program, specifically designed for band directors, by band directors, using a world-class faculty in order to help you improve the way you approach directing. No student has the same needs, so we customize each student's experience. Projects are individually designed to help you improve on all identified weak areas. If you find yourself ignoring a section of your band now because you don't know how to help them, that will change. In addition, our online study and testing platform, Ultimate Pursuit, can help you improve your knowledge throughout the year. Become the director you always wanted to be!